I rocked this b*&^h! (MIC DROP!) I mean, c’mon. It was my first time challenging myself with a cake of this magnitude. I used the picture…and nothing else. This bodes well for me when I scrapbook so hey – it’s gotta be that easy… right? I looked at the recipe later and realized its a mint flavored cake. I didn’t do that – I went with Devil’s food and White. But now I must confess a secret. I have made cakes from scratch. I have followed this genius tip from Pinterest. I can’t tell the difference so my confession is – I used the adapted Pinterest boxed cake recipe (adding extra eggs, butter and milk/no water). The challenge was the food coloring. I ordered some Wilton gel food coloring that was not a gel and after using about 3/4 of a bottle, didn’t have the color I wanted to I switched to the true gel icing colors (Leaf Green – Wilton) and it only took a little to obtain the gorgeous grass green of the frosting and cake color. I started with the Sixlets, laying them out first. Let me say – I’m not soccer-savvy so I had to look closely at the design though – ERROR ALERT! 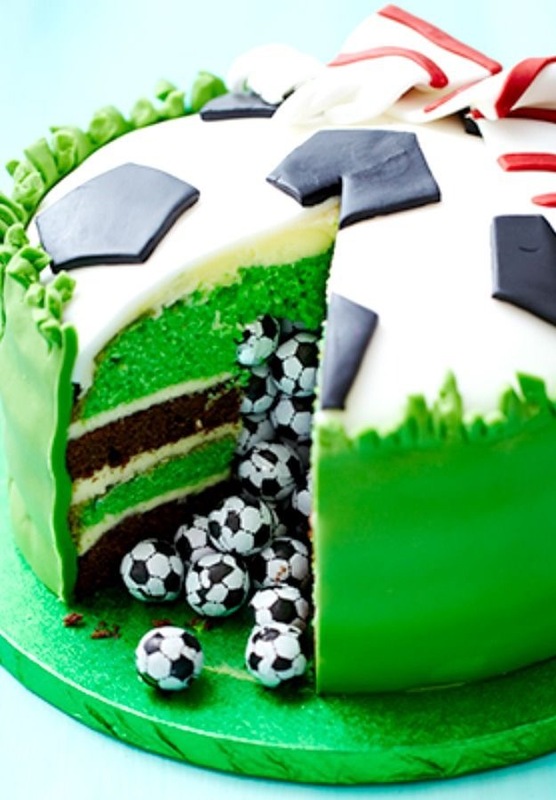 I messed up the soccer ball by not counting that I should have SIX hexagons total, not five, but I hid that with the pinata cut into the cake! (SHHHHH!) I then picked a spot to start and pushed the Sixlet candies into the cake. The best way was to use the foil Soccer ball chocolates as a guide – looking at that and following how a soccer ball looks, I did one at a time and then used the gel to draw the black lines to the next Sixlet hexagon. It was pretty easy. Though again – math brain that I am NOT, I didn’t realize that I should have done six hexagons. Nobody noticed! The piping can hide a LOT of your errors, and in fact, my top cake didn’t turn out perfect, but the green piping hid the shape. So last, pipe the green “grass” around the top of the cake. I used the Wilton smaller star piping tip and just pulled up quickly to allow the frosting to sort of “droop” like grass. Practice first before trying on the cake and you’ll see how easy it is. There are other tips that would probably work just as well. The best part of this cake? You are lucky enough to cut a piece out and eat it, then I put the soccer balls into the pinata and used a little of the Sparkle Gel to hold the soccer ba lls to the plate. All in all a successful, delicious cake! 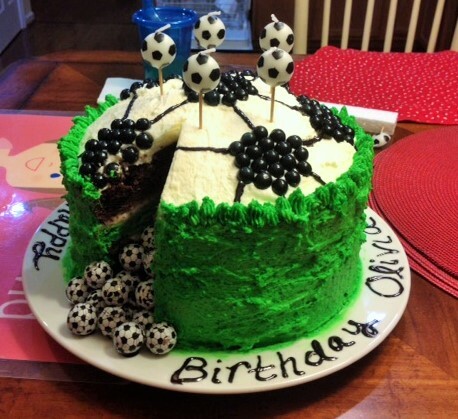 This entry was posted in baking, cake decorating, cakes, soccer, Uncategorized.